I only noticed this the other day, that F1 exhausts tend to have a small 'step' increase in diameter on the primaries, after say 5" of pipe or so. Any idea why? For reflected wave tuning, though I dont know what the distance is from the exhaust valve to the start of the primary pipe, I would imagine even for an F1 engine that is way too short of a pipe length for a tuning peak. Assuming 3" to exhaust valve and a 8" total effective length with an exhaust duration of 200 degrees, that's a tuning peak of 28000 rpm. Beyond that, as far as I'm aware for good wave reflection you want a 50-100% increase in cross section area. Not sure if this quite gets there.. I'm not sure I remember why .. but one thing I can tell you .. the drawing is for a V10, not a V8 as marked. There are 5 pipes there. I've noticed something similar on F1 engines the last 10 years. The exhaust headers resemble 2 stroke expansion chambers rather than straight tubes. Definitely exhaust wave tuning. You may have noticed the same - usually in photos featuring the engines on display stands. Just something I ran into ... here - http://www.rbracing-rsr.com/exhausttech.htm ... it's about a V10, too, but anyway. ... the tail section of a F1 exhaust does not have any megaphone and that the flow at the exit of the merge collector is but a few sizes larger than the primary tubes themselves. You will also notice that after the pipes collect there isn't a very long tail section. This brings up a difference that occurs when you try to “merge” five tubes on one side of a V-10 F1 Engine as opposed to two primary tubes on a Harley. In the case of the F1 exhaust designer he has to, fairly abruptly, end the collector to minimize collector volumes to keep the velocity and wave scavenging at a high level. He can do this by sharply angling the tubes into one another (Ford) or by bringing the tubes parallel and turning them at the collector (most others). It is a question of packaging. Headers are generally circular steel tubing with bends and folds calculated to make the paths from each cylinder's exhaust port to the common outlet all equal length, and joined at narrow angles to encourage pressure waves to flow through the outlet , and not back towards other cylinders. I think it is not increase that has something to do with performance. Single cylinder pipe is not made in one piece so teams either enlarge connecting zone of next part of the pipe so that previous part can fit in before being welded or they use slightly larger pipe (few millimeters) to save time for manufacturing by making that enlargement obsolete. 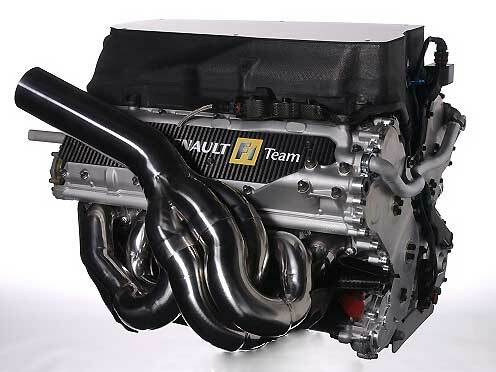 You can see how Renault uses larger pipe for second part for individual cylinder pipes and enlarged pipes for collector. MC - Yes,. your link went exactly to the engine and exhaust system I was thinking about - using multipal increasing sectional pipes echoed an impression of expansion chambers - checkered's link to the Harley exhaust specialist added insight - this company, although producing for a big v-twin of eternal manufacture - refered liberally to F1 exhaust design. reminded me why F1 could learn from other series - merge headers, a very enlightening thread. Thanks to you both. The exhaust pipes are increased in diameter every so often for tuning purposes, it has nothing to do with easy or efficient construction. In the section between the head and collector, giving a gradual increase in diameter gives a sort of megaphone effect. It's an old hot-rod trick. I've read that Stepped Primaries are to prevent 'reversion', which is when the exhaust reverses flow. The step prevents this by causing drag in the expanding exhaust gases, thereby discouraging reversion (imagine the flow in the reverse direction, the gas will have to 'step up'). Reversion: at the beginning of the intake stroke during cam overlap, exaust gas in the header is under high pressure (negative delta P) and is pushed back into the cylinder, diluting the new air/fuel charge. I love to love Senna. The best book I know on the subject is the classic by Philip H Smith. This link is to the publisher - Bentley Publishing. This link lists the index of the book - which is very helpful because you can view the subjects that interest you. The current authority IMO on 2 & 4 stroke intake and exhaust is a Dr Blair. A word of caution. I lent the book to an exfriend and am still waiting for it's return. Stay off my lawn! Edit April 14th - @checkered - The oval vs round tube is a perpetual subject of debate - some say a round section produces "the perfect wave" - some say there's no difference between the oval/round. Last edited by Carlos on Sat Apr 14, 2007 3:29 pm, edited 1 time in total. "with an exhaust duration of 200 degrees"
I'm sure it's more like 320 or 330 degrees. exhaust tuning - this example from Honda, and this one's fresh (From the pits at Sakhir). As far as I can decipher, there's a small but abrupt increase in the diameter of the tube shortly after the gases have entered the tube, but then the diameter is seemingly decreased again towards the merge. I'm wondering whether managing the "reversion" is trickier because the section of the tube changes from an oval to a circle? The increase in diameter seems to happen just where the section becomes a complete circle, or thereabouts. I would venture to guess the first step isn't as big as you think. The first step might be double wall for heat sakes. My drag engine headers are 21'' long; starting at 1.875'', then 2.000 and ending at 2.125. Does someone know why Ferrari engine sound is louder and with a higher pitch than other cars??? The length depends on the order you're tuning for. The first order frequencies have the greatest amplitude, and thus the most tuning effect. But they also require a longer pipe length. Secondary or tertiary frequencies require much shorter primary tube lengths, and can also provide some benefit, but their acoustic wave amplitudes will be much less. And as someone mentioned, the short primary tuned for secondary or tertiary frequencies, may provide an "anti-reversion" effect.